POLISHED wood, leather seats, flushing toilets and more than enough room to stretch your legs and maybe have a seat to yourself. 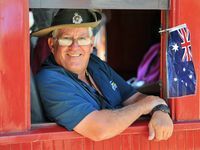 Life's not too bad on the heritage carriages that form the focal point of the Anzac troop train re-enactment steaming across Queensland this week. 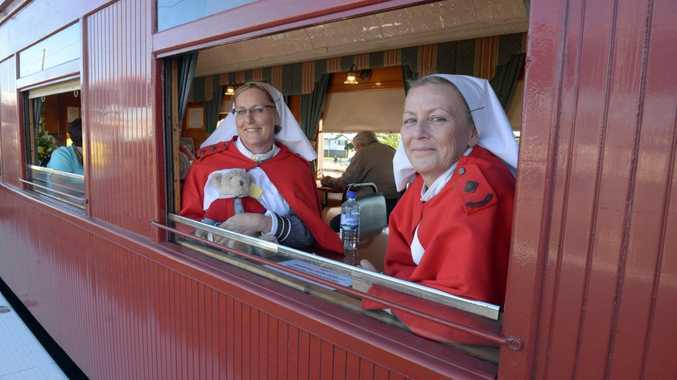 In fact, we're sitting in the lap of luxury compared to the soldiers who criss-crossed Queensland on the way to their barracks during the First World War. Jammed in like sardines in a can, many hundreds of kitbag-carrying uniformed young men would stand or sit - space permitting - shoulder to shoulder for hours on end. Ted Kirk, a 91-year-old Second World War veteran from Gayndah tells me his trip on this train is a far cry from the experiences of his youth. Mr Kirk, a decorated fighter pilot, travelled on many trains between Queensland and NSW airbases before his overseas posting. "I was so tired on one train that I tried to find a spot to sleep," he says. "The only place I could find was in the latrines. "I went to sleep with my feet in the toilet bowl and my head under the water tap. 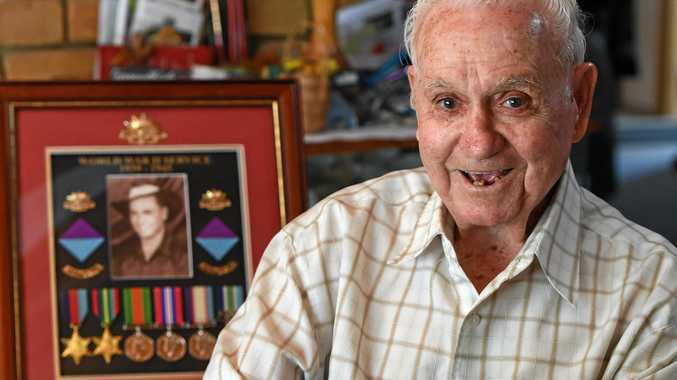 "Every time someone turned on the tap I'd get a face wash."
Jim Richters, 91, saw action in Borneo and New Guinea during the Second World War. He says it was often tough going on the train. "I used to climb up into the luggage racks to sleep," he says. While the 250 passengers on board the train are getting a little taste of history on this five-day journey, we will never truly understand the hardships faced by men like Mr Richters and Mr Kirk.